When it comes to how humans affect fresh water, you might think of factory emissions, dumping waste and agricultural runoff. In fact, one of the most significant ways that humans affect fresh water around the world is by the construction of dams and the creation of reservoirs. Dams and reservoirs are important to all of us because they provide many benefits for our lives. These include hydroelectric power to heat our homes and power our industries, stable water supplies for irrigation and agriculture, reliable sources of drinking water, protection from floods and greater recreational opportunities. Dams, however, can also cause unintended consequences that sometimes prove harmful. Reservoirs may greatly affect fish production and disrupt the life cycles of fish, and affect water quality, wildlife and biodiversity. On a global scale, dams and reservoirs are altering biogeochemical cycling of carbon and nutrients that affect our climate and the health of oceans. At IISD Experimental Lakes Area, we have a long history of research on the effects of dams and reservoirs—a major partner of which has been Manitoba Hydro. In all cases, we ultimately want to provide advice on how to design and manage reservoirs to minimize their impact on the environment. A strong argument for the development of hydroelectric power has been that it reduces greenhouse gas (GHG) emissions such as carbon dioxide and methane, which contribute to climate change. In the early 1990s, however, our researchers set about to explore the relationship between hydroelectric reservoir creation and the production of GHGs. They suggested that decomposition of carbon in flooded soils and vegetation may result in the production of carbon dioxide and methane. Effectively, flooding of forests and wetlands would convert them from being places where carbon is taken up and stored to areas that release GHGs to the atmosphere. The question is: to what extent were these GHGs created by these processes, and how do these levels compare with GHGs produced from other sources of energy production, such as fossil fuels? 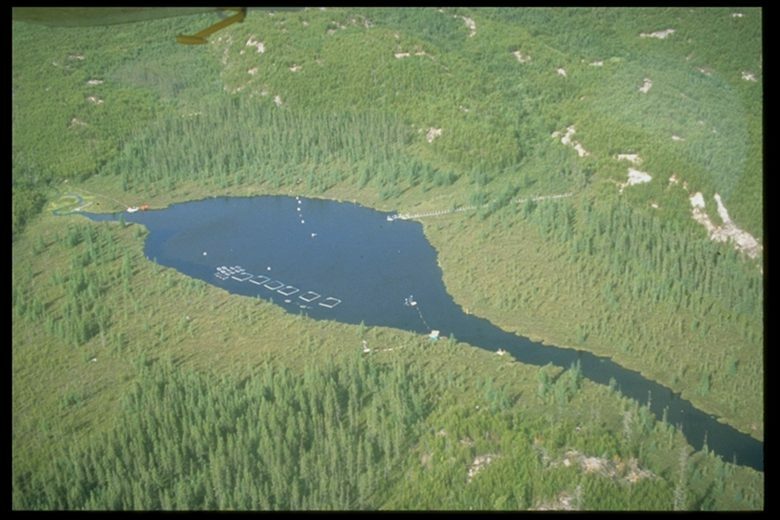 Beginning in 1991, researchers at ELA undertook a whole-ecosystem experiment called the Experimental Lakes Area Reservoir Project (ELARP) where they created a small reservoir in a wetland pond by building a small dam at the outflow. Lake 979 before being flooded to mimic the process of reservoir development. Lake 979 after being flooded. We created a small reservoir in a wetland pond by building a small dam at the outflow. We found that both carbon dioxide and methane, an especially potent greenhouse gas, were produced in higher levels after flooding, suggesting that reservoirs can be sources of GHGs. This research led to the widespread recognition of the potential importance of reservoirs as sources of GHGs and to their inclusion in inventories of global GHG production. Subsequent calculations indicated that, in most cases, hydroelectric power produces far lower levels of GHGs than fossil fuel sources producing equivalent amounts of energy. Based on those results, we then wanted to see if the amount of GHGs produced from a reservoir may be determined by how much carbon is stored in flooded vegetation and soils. If so, reservoirs should be designed to maximize flooding in areas with thin soils and little vegetation and to minimize flooding in areas with large stores of carbon, such as wetlands. The removal of soils and vegetation prior to flooding could possibly reduce GHG production. We found that both carbon dioxide and methane, an especially potent greenhouse gas, were produced in higher levels after flooding, suggesting that reservoirs can be sources of GHGs. In the FLooded Uplands Dynamics EXperiment (FLUDEX), three small reservoirs were created in areas with different amounts of soil and vegetation. Although we did not find large differences in GHG production among reservoirs, we did learn much more about the processes involved. In FLUDEX experiment, three small reservoirs were created in areas with different amounts of soil and vegetation. The ELARP and FLUDEX projects described above were also designed to examine mercury cycling in new reservoirs. Mercury is a neurotoxin that accumulates in fish and can create health risks for consumers of fish, including humans. 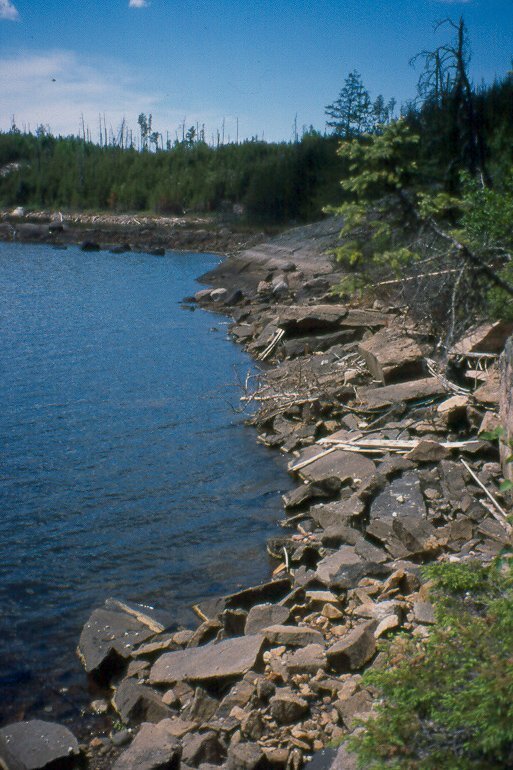 In the 1970s, researchers from the Freshwater Institute in Winnipeg and later working at ELA were among the first to identify that reservoir creation often leads to unsafe increases in mercury concentrations in fish. 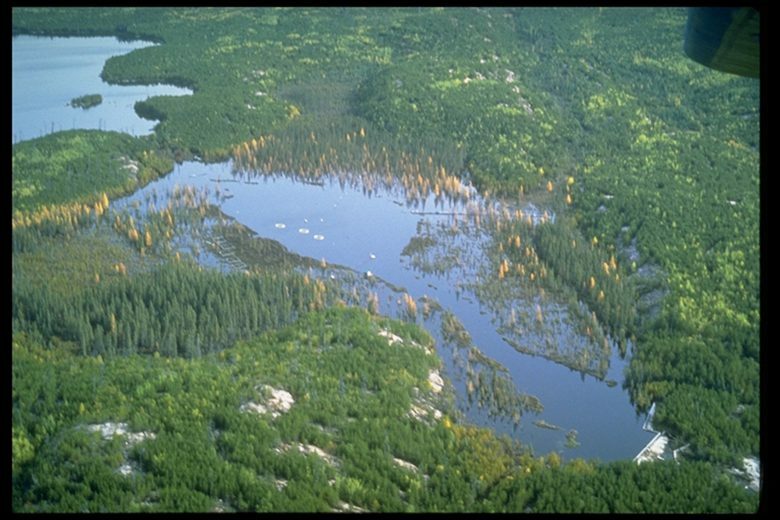 These increases resulted in the closure of fisheries on several northern Canadian reservoirs in Manitoba, Quebec and elsewhere, with often serious consequences for local communities. In fact, flooding does not create new mercury, but instead creates conditions that favour and increase the conversion by bacteria of mercury existing in flooded soils and vegetation to methyl mercury—a form that is especially toxic and that bioaccumulates and biomagnifies to high levels in fish. In 1991, the ELARP project took advantage of newly developed methods for measuring methyl mercury in water and sediments and revealed the amount of time methyl mercury production takes. The FLUDEX experiment showed that the duration of elevated methyl mercury production increased in reservoirs with more carbon. Reservoir creation and management are also well known to affect fish production—and our research has helped to explain why. The ELARP and FLUDEX experiments showed that flooding land not only increases GHG and methyl mercury production, but also results in the release of nutrients from decomposing soils and vegetation. These nutrients stimulate the growth of algae and invertebrates that are the base of the food web and ultimately support higher levels of fish production. In fact, the period of increased nutrients and invertebrate production lasted for more than 10 years in the ELARP reservoir. Reservoirs often feature seasonal and daily drawdowns (or lowering) of water levels. Researchers explored the potential effect of these drawdowns, in isolation from flooding impacts, in a third whole-ecosystem experiment. The water level of a 15-metre deep lake was lowered by 2–3 metres to mimic drawdowns in northern hydroelectric reservoirs. These drawdowns resulted in decreases in nearshore communities of insects and weeds that provide food and habitat for fish. 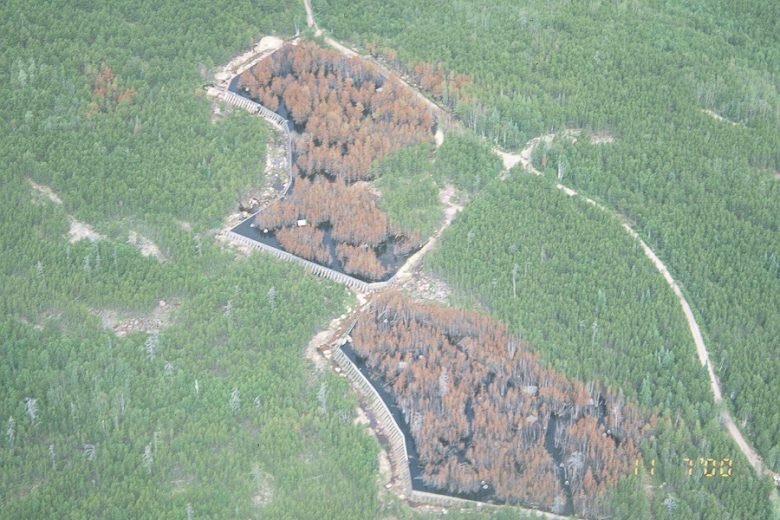 As a result of the drawdowns, the lake’s population of lake whitefish failed to reproduce. Had the experiment continued, this population would probably have died out completely. This experiment at Lake 226 helped us understand the impacts of lake drawdowns in northern hydroelectric reservoirs. We discovered the importance of understanding the life cycles of key fish species and of strategic timing of drawdowns to minimize negative impacts. In the coming years, large numbers of dams are scheduled to be built in northern Canada and around the world. Here at IISD Experimental Lakes Area, we continue to work closely with hydroelectric companies, governments and other groups to provide key advice to help design and manage these dams so we can balance the many benefits they bring us with their potential environmental impacts.